SAN FRANCISCO (Feb. 14, 2018) — City Attorney Dennis Herrera today announced a deal with Lyft that will advance Herrera’s investigation into whether Uber and Lyft are following state and local laws on access, discrimination, safety and pay. The agreement ensures that relevant city experts can review information reported annually by Lyft to the California Public Utilities Commission, or CPUC, that was turned over under the subpoena. While Lyft produced that information in response to the subpoena, it originally insisted that City Attorney’s Office lawyers were the only people who could view it. That was an unacceptable barrier to the investigation, precluding experts on topics like traffic safety from viewing key information. 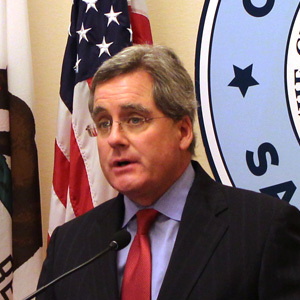 Herrera issued subpoenas on June 5, 2017 to Lyft, Uber and Uber’s affiliates as part of his investigation into whether the ride-hailing companies and their estimated 45,000 drivers are creating a public nuisance in San Francisco by jeopardizing public safety, discriminating or otherwise violating local and state laws. The administrative subpoenas seek four years of records in eight categories, including miles and hours logged by drivers, incentives that encourage drivers to “commute” to San Francisco from the Central Valley and Los Angeles, driver guidance and training, accessible vehicle information, and the routes taken by these drivers in San Francisco. The new agreement gives relevant experts in areas like traffic safety and law enforcement access to that data, solely for the purpose of assisting Herrera’s investigation. The City will continue to preserve any bona fide trade secrets in those reports by safeguarding them from public disclosure or disclosure to competitors like Uber. After fighting every step of the way in and out of court, Uber has produced very few documents, and very little data, in response to any of the eight categories in the City’s subpoenas. It has refused to disclose its annual reports to the CPUC, or any of the contents thereof. A San Francisco Superior Court judge ordered Uber to turn over that information to the City, but Uber appealed.